Cities, such as Minneapolis, often provide a listing of tree service companies that are licensed there. 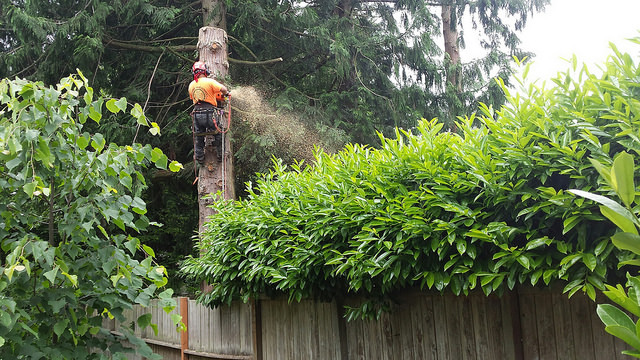 Why should property owners take this into consideration when hiring a tree service company? The number one reason is that these cities require a tree care license by law. If you hire a non-licensed tree care company, both you and the company are violating the city ordinance. Why do some cities require tree care companies to have a license? To protect their citizens. Most cities require that companies show proof of worker’s compensation and liability insurance as part of the licensing requirements. Home owners who hire a tree service company that does not have worker’s compensation insurance for their employees are taking a huge risk. In many cases, if a worker is injured on your property and his employer does not have worker’s compensation insurance, you – the home owner – may become liable for the sustained injuries. Some cities also require that tree care companies show proof of expertise before they can receive a license. For example the city may require the company to have an ISA Certified Arborist on staff. Before hiring a tree service company, check with your city to see if a license is required. Ostvig Tree Care is licensed in all of the cities in the Twin Cities metro area where it is required. How do you choose the best certified arborist? Find out here. Photo from flickr user, Wonderlane.